Just a few decades ago, Greenport Village looked very different. Fishermen describe as many as 50 towering fishing vessels crammed into the deepwater port, making pit stops at Claudio’s dock before their offshore expeditions in the Atlantic. The docks were swarmed with fishing crews unloading their stock for sale at fish markets across the East Coast. But today, the dozens of captains whose boats once fed Greenport’s fishing industry have either fled for other ports or been scuppered altogether. Greenport is sold to tourists as a fishing village (the village crest features a sailing ship from its whaling heyday). And while many commercial baymen, oyster farmers and charter boat captains still operate out of the harbor, the huge commercial fleet that powered the working waterfront is almost completely gone. That once-great fleet took its penultimate blow this fall. Third-generation fisherman Sidney “Sid” Smith III sold his 63-foot fishing boat, Merit, and left the industry in October, leaving just one offshore commercial fleet fisherman operating out of Greenport Village — Mark Phillips. Mr. Smith — a 61-year-old outspoken captain who’s had his run-ins with state and local officials over his fishing operation — said he’s tired of fighting the trend of a dying industry. Mr. Phillips, who operates out of Greenport Harbor in the 83-footer Illusion, repeated the old saying: The more things change, the more they stay the same. He thought the idiom would always apply to Greenport, he said. He’s not convinced anymore. Another commercial fisherman who used to go offshoring, Bob Hamilton, also remains in Greenport Harbor. But he’s given up on the multi-day voyages and avoids the winter season altogether by fishing only in local waters on a “semi-retired” basis, he said. The writing has been on the wall for years, the three fishermen said. The transient commercial fleet was in its heyday in the 1980s and ’90s after the bunker boom of the ’60s and ’70s died out. But the fleet has moved on to other waters, and all three pointed to the same source: New York State regulations. Specifically, they said, the state’s fuel tax. First created in the 1990s, the state tax affects fishing boat fuel sales. The state later reimburses the fishermen the full amount they’ve paid. “It’s an interest-free loan to the state,” Mr. Phillips huffed. Mary Bess Phillips, Mr. Phillip’s wife and a Village Board trustee, said the couple pays between $15,000 and $20,000 through the fuel tax and then must wait to get the money back. “A fishing boat’s whole goal is to get the boat in, get it unloaded, get it serviced, get the crew back on it and get it back out, not wait,” Ms. Phillips said. “It takes your cash flow.” Both of the Phillips lobbied to former Gov. Mario Cuomo to remove the tax, but were unsuccessful. Though the fuel tax is returned faster now than in previous years, Ms. Phillips said the damage was already done to the commercial fleets. Mr. Phillips, Mr. Hamilton and Mr. Smith also accused the state of overregulation, saying bureaucracy made it difficult for captains to navigate the red tape. Chief among the state’s mistakes was the perceived failure to draft proper fishing management plans, the fishermen said. While other states like Massachusetts, Rhode Island, Connecticut and New Jersey keep detailed records of the fishing stocks, they blamed the state for not following suit. “They killed us with the fuel and they killed us with no data to back up the quotas,” Ms. Phillips said. Mr. Smith has had his own feuds with the state. In 2011, the state Department of Environmental Conservation charged him with two felonies after accusing him of taking more than his legal catch limit. Mr. Smith — who said he had forgotten to send an email to the state detailing his fishing plans — pleaded guilty to lesser charges. He then fought the state to get reimbursed for the catch they seized during its investigation. Since Mr. Smith was unable to sell his product, the state was liable for damages, he argued. In 2013, he succeeded in part, getting a more than $8,000 check from the state. He pumped the money back into fuel costs for his ship. Mr. Smith has also sued Greenport Village over his insurance requirement fees and has been a vocal opponent of the village’s decision to dock the Fire Fighter floating museum next to his ship. Mr. Phillips said the state regulations and fuel taxes drove commercial fishing captains to seek more friendly ports. 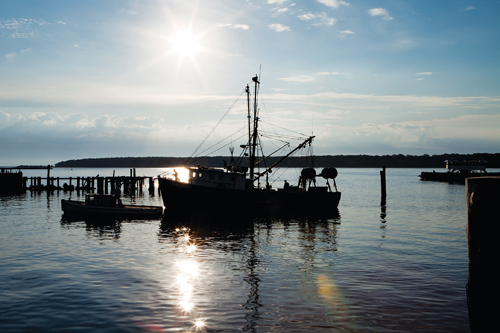 With the big fleet gone, the infrastructure of the Greenport fishing industry began to wither away due to lack of customers. The hardware stores closed. The ice-making shops closed. The shoe store and the work clothing store closed. The groups of crewmen looking for work left town and moved on to other ports. Just this year, Lewis Marine in Greenport — a marine supply company and mainstay of the working waterfront, formerly known as East End Supply Company — shut down due to a poor economy, the company’s manager said. Though the fleet is all but gone, Greenport Village has found new life as a key destination in the North Fork’s booming tourist economy. Popular seafood eateries sell their wares where packinghouses once stood. Well-reviewed restaurants have moved into the village. Mr. Hamilton — whose family’s fishing heritage dates back centuries to Greenport’s golden years of whaling — said the tradition hasn’t been kept alive. Ms. Phillips said it’s not just the business landscape that has changed: It’s the character of the village itself. Ms. Phillips remembers a time when dock workers would return to the village reeking of fish. She thinks many new residents and tourists in Greenport Village wouldn’t tolerate the sounds and smells of the fishing industry. Mr. Phillips said he would be thrilled to see year-round fishing return to the village, but said he understands the decision isn’t his to make anymore. The village has changed, he said, almost certainly forever. While some small-scale commercial fishermen and oyster farmers still operate out of the village, the hundreds of employees who benefited from the industry -are gone, he said. The “working waterfront” has changed to the “tourist waterfront,” he added. The tourist economy has also spiked housing prices, forcing many young people out of the area, Mr. Hubbard said. But others say Greenport’s romanticized fishing history is best left in the past. Former Greenport Mayor Joseph Townsend said he remembers growing up in the rough-and-tumble days of Greenport Harbor in the 1950s. “Our mothers would never let us go downtown on Friday nights because the fleets would be in and things would get pretty rowdy,” he said. He said commercial fishing brought more money to Greenport Village than anything else. But the town’s population has changed as more second-homeowners try to capitalize on Greenport’s rising status as a daytrip destination. That’s not necessarily a bad thing, he said. He recalled that Greenport was in “very, very bad shape” in the 1970s when he was mayor. “Everybody had left that could leave,” he said. That’s drawing in skilled craftsmen and artists, said Pat Mundus, a South Fork native who moved to Greenport about eight years ago. Ms. Mundus’ fishing roots also run deep; her father was the inspiration for the character Quint from “Jaws.” But she said Greenport has done a good job attracting people to the village. That economic energy has shifted from the commercial fishing fleets to the recreational boating community, she said. Shipbuilders like Wooden Boatworks are “cranking out incredibly fine yachts,” she said. “These guys are all perpetuating the same skills and crafts from hundreds of years ago,” she said. A few businesses, including Greenport Yacht and Shipbuilding, still service the big commercial boats, but many craftsmen have pivoted to embrace the recreational maritime market. “For a long time Greenport has been able to attract artists, and it’s doing a good job,” Ms. Mundus said. Despite the way Greenport Village has changed, Mr. Phillips said he won’t stop fishing. He said he’s stubborn -— a “thorn in everyone’s side” that loves fishing too much to quit. His vessel, the Illusion, isn’t just a source of income. It’s a representation of his life, launched the same year he bought his first house and his son was born. It’s what kept Mr. Smith going as well. Mr. Smith said the regulations were only part of his decision to quit. He said a crew that was working his ship while he was away crashed Merit off Martha’s Vineyard in the summer; his main source of income was out of commission for months being repaired. Upcoming back surgery was another sign it was his time to go, Mr. Smith said. The cause of his injured back? Years of working the water, he said. Mr. Smith hopes his new life will be easier and less stressful. Still, he said it was hard to see the ship he bought and repaired in 1997 go to a new owner, who plans to sail the vessel out of Montauk. On the day he sold the boat in Greenport last month, Mr. Smith turned, marched off the village’s Railroad Dock and drove away without looking back, he said. He couldn’t bear to look back. “There were times like that where it was too emotional, even for the tough fishing guy like me,” he said. Mr. Smith had his back surgery at the beginning of November — rods put into his spine and repairs to a split disc that left him bedridden for days. He’s getting antsy, like cabin fever. He hates being stuck inside his small Southold home, where a radio station blares classic rock songs like The Band’s “The Weight.” His fishing charts hang on the wall and his ship’s wheel and his rusted torpedo shell are scattered around the house, reminders of the industry he left behind. Like Mr. Phillips, Mr. Smith said he won’t be able to resist the call of the water for good. He’s planning to work as a tugboat captain in Flushing once he’s fully recovered. Maybe he’ll rejoin the commercial fishing fleets someday, Mr. Smith said. Many fishermen do. But he said one thing is for sure: It won’t be in Greenport.